A-HOTEL.com - Luxury and cheap accommodation in Xóm Ða Mẹ (1), Vietnam. Prices and hotel, apartment booking in Xóm Ða Mẹ (1) and surrounding. Situated in Da Nang, 2.4 km from Marble Mountains, Liam’s house features a living room with a flat-screen TV, and free WiFi. Set in Da Nang, 2.6 km from Non Nuoc Hamlet and 2. Situated in Da Nang, within 2 km of Marble Mountains, Villa Kimkim is an accommodation offering mountain views. It features barbecue facilities, garden views and free WiFi. Set within 2.7 km of Non Nuoc Hamlet, Phuong Hong Motel in Da Nang provides a terrace, as well as free WiFi. Situated within 2.3 km of Non Nuoc Hamlet and 2. Located in Da Nang, 1.2 km from Marble Mountains and 1. 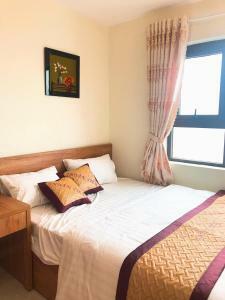 Set 2.1 km from Non Nuoc Hamlet, 95 Apartments offers accommodation with a balcony and free WiFi. Hotel Yen Tran is located in Da Nang. Well situated in the Marble Moutain district, the property is set 2. 3.3 km from Marble Mountains, Nhà nghỉ Chinsu is located in Da Nang and offers rooms with free WiFi. Set in Da Nang, Nhà nghỉ Đông Nam offers accommodation within 3.3 km of Marble Mountains. Set in Da Nang, within 2 km of Non Nuoc Hamlet and 2.1 km of Marble Mountains, Hoa Binh Hotel features free WiFi. Located in Da Nang, 1.7 km from Marble Mountains, Huong Hoa Guesthouse has a terrace and a shared lounge. Set in Da Nang, Smile Home offers beachfront accommodation 1.5 km from Non Nuoc Hamlet and offers various facilities, such as a terrace and a bar. Located within 3.7 km of Asia Park Danang and 5 km of Love Lock Bridge Da Nang in Da Nang, Casavita Tourane features accommodation with free WiFi and flat-screen TV. A luxurious stay at Furama Resort Danang begins your journey to UNESCO-listed sites like Hue Imperial City, located a 2-hour drive from the resort. World-class facilities like freshwater pools, a spa, and 4 dining options await guests. Set in Da Nang, 3.9 km from Asia Park Danang, Nhan House features a garden. Situated in Da Nang, One Bedroom Garden View Residence features accommodation with a terrace and free WiFi. The property is 1. Da Nang Apartment is an accommodation set in Da Nang, 3.2 km from Non Nuoc Hamlet and 3.